Trenching an East Wenatchee sprinkler system. Sprinklers are our favorite. Doesn't matter if it's a new install or a repair, we will do them all. Irrigation blowout in Wenatchee, WA. We have to blow out the water from the sprinkler lines in the fall or the pipes could freeze causing lots of damage. This main line feeds over 25 houses in Wenatchee, WA. The bell on the orginal pipe was leaking. It just so happened that the contrctor installed these lines right on top of all the utilities! One of my toughest ever repairs! Domestic water leak in Wenatchee, WA. This house used have a domestic hook up. Who ever disconnected the water line did not do it properly and it leaked for years until I fixed it. 2' Filter in Sunnyslope neighborhood in Wenatchee, WA. This is a very nice brush away filter. Just close a valve and spin the handle and the filter is clean. No need to even take it apart. Also there is a big 2" pressure reducer. Correctly repairing a broken line. 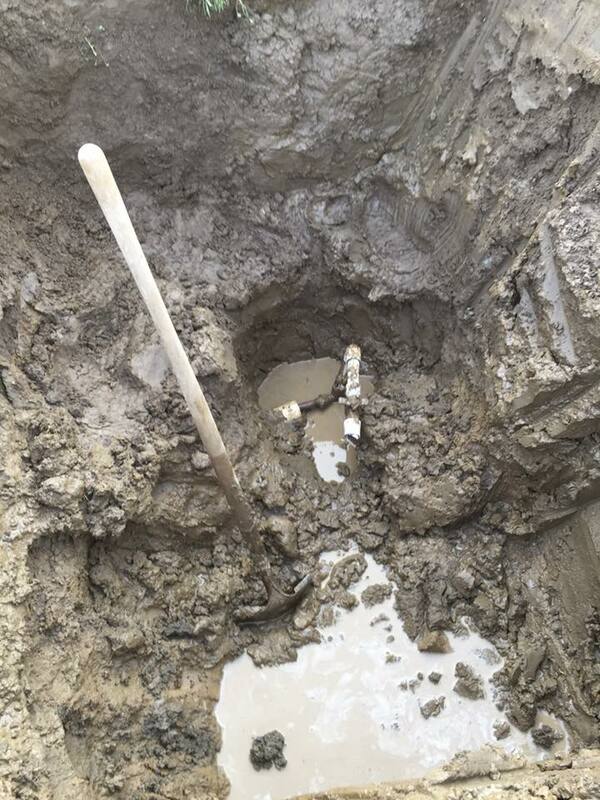 The contractor who installed the fiber conduit broke the 2" irrigation line orginally. They tried to fix it, but htis is a very high pressure water line that is fed from The Greater Wenatchee Water District in East Wneatchee, WA. 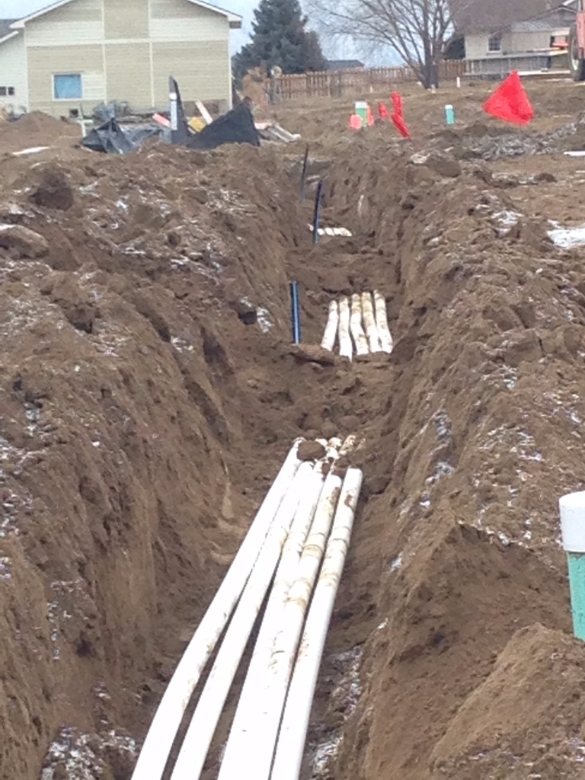 Nice big trenches mean that our pipes can stay neeat and organized without crossing each other. 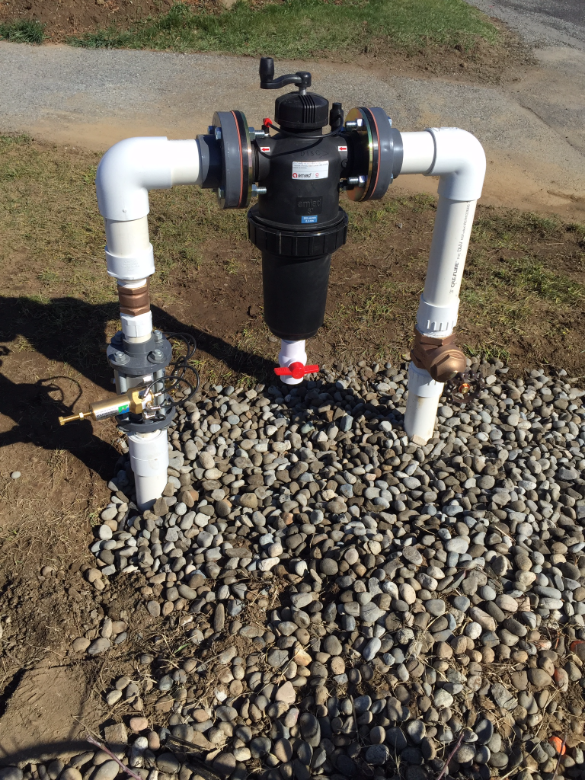 If you have a cross connection into a domestic water source, you have to have the proper backflow prevention device. This house has domestic water and irrigation water so we used a reduced pressure backflow assembly. Every sprinkler system we install is specially designed for each job. There are many factors to considering when designing a new system or fixing an older system that isn't working properly. These factors include soil type, the grade of the area to be irrigated, area size, irrigation water vs. domestic water, etc. We only use the best products available on the market that we purchase locally from S&W Irrigation, located in Wenatchee. Our jobs are kept clean and organized which help us to make quick efficient work of everything that we do. All of our sprinkler systems and irrigation repairs come with a 1 year warranty on parts and installation. This is where we excel. There are many types of irrigation repairs including: irrigation line breaks and cracks, broken sprinklers, plugged sprinklers, drip line repairs, broken valves, stuck solenoids, broken timers, pump installs, installing double check valves (as long as they are outside). We have seen a lot in 10 years and are very quick at troubleshooting and diagnosing problems. So if you are having a problem, we are very confident that we will know what's wrong. Irrigation repair rate is $75/hr, but many times we are able to fix the problem under an hour and only charge a call out fee of $60. This is what we enjoy doing the best. There is more to designing and installing a sprinkler system than just throwing sprinklers on a PVC line. The amount of water and pressure available as well as the type of irrigating you will be doing are all factors that have to be considered. We can do as much or as little as you want. I have customers that dig and fill the trenches, so all we have to do is install. Digging, cleaning out trenches, and back filling is one of the most expensive parts. So if you are trying to save money and don't mind working, you can dig it yourself. With all new installs we take the time to teach the homeowner how to operate and maintain their new system. This includes how to set the timer, adjust sprinklers, and cleaning the filter.